Learn German this summer in the beautiful historic city! Vienna is an ideal-typical European city similar to Barcelona, London, Milan, Paris or Rome, but unlike the others it is very compact and easy to negotiate. Vienna is referred to by many as a unique onion, with each of the urban layers surrounding the oldest historic center being equally important to the overall flavor of the city. The Austrian capital therefore embraces all the traditions of a European city, from Roman foundations through to Gothic, Baroque and Historicism. Tourists are eager to visit Vienna because of the city's exciting combination of the royal-imperial flair of the past with the latest trends, the responsible cultivation of a precious heritage and charming traditions. But much more than old buildings turn Vienna into a city of beauty: one also finds excellent museums, fine art collections and world-renowned works of art in the city. Vienna boasts 50 theaters, including three opera houses and two theaters staging musicals, 100 museums. Serious music lovers have long considered Vienna to be just this side of paradise: one encounters music everywhere, from the sounds of a child practicing a Mozart piano sonata through an open window to street musicians playing classical as well as folk music. No other city has been home to so many composers of international renown: some, such as Schubert, Strauss, Schoenberg and Berg were born there, others, such as Mozart, Beethoven, Haydn, Brahms and Mahler chose to live there. Culinary culture is an integral part of the way of life that has distinguished Vienna for centuries. Viennese cuisine is perhaps the only cuisine in the world that is named for a city and not a country. Vienna has been influenced by many countries throughout the past ten centuries, something that may explain much of its attraction - and not only in the realm of cooking. The word Heurigen has long been part of the vocabulary of tourism in Vienna - no sightseeing visit to the city on the Danube would be complete without a visit to a Viennese Heurigen. Heurigens have become a synonym for some of what is best in Vienna: hospitality, gemütlichkeit, joie de vivre mingled with a little melancholy, good solid food and refreshing dry wine. In fact, as a uniquely Viennese institution, a way of life, Heurigens are second only to coffeehouses. You will find designer stores, shopping temples and trendy pubs and restaurants right next door to traditional shops where purveyors to the imperial court once served the emperor personally. Kärntner Strasse, Graben and Kohlmarkt, in the heart of the historic center, are the classic streets to head to if you want to take a little piece of Vienna home with you. And there are thousands of opportunities to do so, with the vast choice including precious jewelry, quality Viennese glassware and porcelain, fashions of timeless Viennese elegance or international contemporary design, and famous, mouthwatering chocolate temptations. A natural paradise including forests, grassland, parks and gardens cover some 20,000 hectares or about half of the city, and then there is the Danube and other stretches of water on top of that. The Vienna Woods are not only the green lung of the city, but provide visitors with footpaths and mountain-bike trails of all distances. Vienna is fully geared to pedal power with almost 1,000 kilometers of urban cycle paths. A number of places in the city such as the vast (6,000,000sqm) Prater park, a former imperial hunting ground in the rambling Danube wetlands, are best explored by bike anyway. The Danube Island is another vast area for outdoor pursuits. It has numerous bathing areas, cycle paths, playgrounds and sports facilities. And on the still waters of the New Danube you can go for a dip or a swim, or get into a rowing boat, sailboat or even onto water-skis. 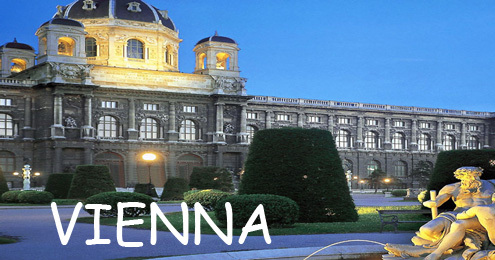 Vienna is the capital of Austria with 2 million inhabitants and is situated on the banks of the Danube. The influx of visitors from all over the world has made Vienna the most popular urban tourist destination in Austria. Austria's climate is generally moderate and mild. Average summer temperatures range from 20°C to 30°C, the average winter temperatures are around 0°.